It is our ever popular 16ah Lithium battery housed inside an original Powakaddy "Plug n Play" box. 18 Hole Lithium box is an official Powakaddy product that features the new "Plug n Play" design that is compatible with the new FW3, FW5 & FW7 electric golf trolleys. 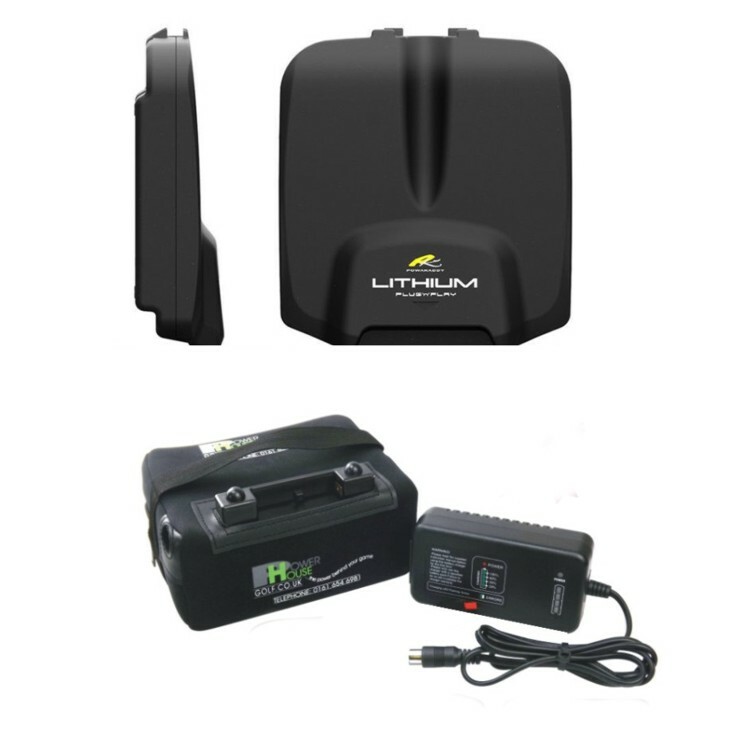 The Powerhouse Golf Lithium Battery LiFePO4 is far safer than the standard Lithium Ion battery, it also has a 50% more life expectancy. It is supplied fully protected by a sophisticated specially designed lithium battery management system that constantly monitors every cell to ensure the battery is always optimised for best performance and life. Also supplied with its own LiFePO4 Lithium charger that fully charges the lithium battery in around 3/4 hrs from flat. Life expectancy*: 1000-2000 Cycles depending on terrain and charger type. Duration: 18-27 hole capacity depending on terrain and conditions. Note* Life expectancy will be effected by Frequency of use, payload and terrain. **Terms and Conditions apply; please see the warranties page for further information. 2-year warranty on the battery. It is our intention to supply a product that provides and gives faultless service during its lifetime. However, from time to time things can go wrong. You battery is shipped as standard with a full comprehensive warranty as explained in the "Warranty tab". *However, should your battery develop a fault and needs to be returned to us, it can only be shipped using a carrier company certified to do so, and not Royal Mail. The current price of this service to send and return is £12.99. The "Additional Transport Warranty" covers this return/redelivery for 2 years. We do not expect the battery to fail, but in the event of it doing so, everything is covered. Just notify us and we will do the rest.